Yesterday, I was thrilled at the possibility of northern lights being visible in Connecticut. I have vivid memories of the handful of times I have witnessed this display of dancing light, but it’s been ages since I saw them last. These mysterious lights must have been terrifying to people throughout history without our knowledge of solar flares and ions bumping into Earth’s atmosphere. Fortunately, knowing this doesn’t diminish their beauty or their ability to inspire. I don’t share my own poetry very often, but I couldn’t find a poem that matched my memories or feelings about the auroras I’ve seen. So here is a very rough draft of a poem inspired by watching northern lights with my boys in March of 1989.
in veils of glowing green. Gaze at the world through the eyes of a four-year old today and be amazed. And, for plenty of amazing poetry, be sure to stop by Mainely Write, where Donna has the Poetry Friday roundup. This is beautiful! I love the flow, the feeling. 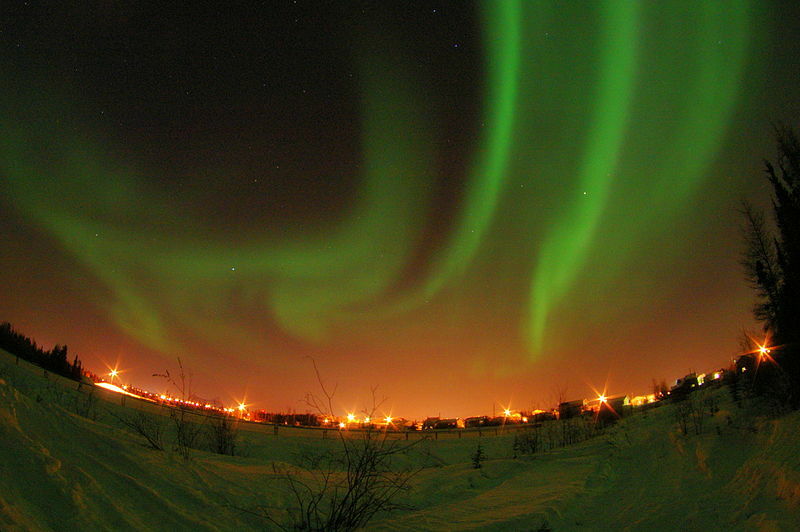 Envious that you’ve actually seen the Northern Lights before. What a lovely swirl of a poem :)! Beautiful. Magical. Love these words “… curtains of shimmering light…veils of glowing green…” Perfect. I am awestruck by the idea of the northern lights. What a privilege to see them! Thanks for sharing. You really transported me to that magical moment. I’ve never seen them, & even in Denver, they say there’s a chance, but only outside the city lights. So far, no one has posted that they’ve seen anything. I love that you shared this memory, Catherine, & the final word is exactly right, I imagine! Imagine only because it’s all I can do! Fabulous poem reflecting a fabulous experience. If I assemble a bucket list, the Northern Lights will definitely go on it! Magic indeed–that’s a good description for this poem! Oh Catherine, my heart jumped at this. Seeing the aurora borealis is one of things I would have to do in my lifetime. I told a friend once that this describes our friendship so wondrously. Those colourful lights seemingly from a parallel universe. Truly magical. Northern Lights. Plus, it reminds me of Philip Pullman’s Dark Materials, my absolute favourite series. That was an amazing poem! I wanted to see the Northern Lights outside a couple of nights ago, but I heard from a friend that they were barely visible. I think that seeing the Northern Lights will be on my life-long bucket list. You should share your poems more often. This one flows and uses imagery to place me there as a small child experiencing the wonder. I would love to see the Northern Lights one day. This is gorgeous, Catherine! You definitely caught some of that magic with your words. Sorry it took me so long to get here, but I’m so glad I finally did! Thanks for re-sharing and linking in! I did a retro-link on today’s Amazon post since I couldn’t manage to get you added in a more timely fashion! !